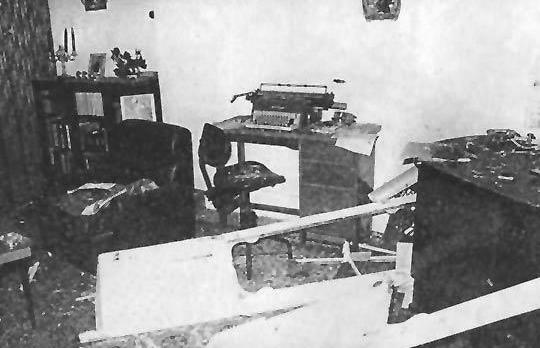 The wrecked interior of Fenech Adami's home in Birkirkara. October 15, 1979, made Eddie Fenech Adami and doomed the Labour Party for several years afterwards. Kurt Sansone analyses the political impact of the violent acts that characterised Black Monday. The violent attack on his family at their home in 1979 helped consolidate Eddie Fenech Adami's leadership, the former prime minister acknowledges 30 years after the events that occurred on the day known as Black Monday. His admission gives credence to historian Dominic Fenech's analysis. Prof. Fenech, then Labour Party general secretary, argues that the thugs who went on a violent rampage "did more in that one evening to build the stature of Dr Fenech Adami than Louis Galea and his team had succeeded in doing in the preceding two years." Elected PN leader in 1977, Dr Fenech Adami was still trying to change a party perceived to be elitist and hounded by the different factions created by the leadership race. This all changed one evening in October when Labour supporters who had attended a demonstration in Valletta went on a rampage, first burning The Times building and then attacking the opposition leader's family at their Birkirkara home. "Those events set the Nationalist Party on a sound footing in defence of democracy in the country. There is no doubt that they consolidated my position as the new PN leader," Dr Fenech Adami reminisces of the day that strengthened his leadership and scarred his family. People realised things were not functioning normally, he said, but that day the violence reached boiling point. "My wife was beaten up and my children were scarred by what happened," he said. A mass meeting held outside Dr Fenech Adami's residence five days later saw one of the largest crowds ever for a PN event, a signal the mood in the country was changing. The then deputy PN leader Guido de Marco concurs. He said the burning of The Times was a serious attack on freedom of expression. "The German Luftwaffe failed to stop The Times from being published every day and so did the Labour thugs who attacked the building in 1979. People reacted positively to the fact that The Times still went to print that day, since it did not bow to violence," he said. It was he who made the necessary arrangements for the newspaper to be printed at the Nationalist printing press after Strickland House was gutted. Those events made people realise that the administration would stop at nothing and the police were impotent to apply the law, Prof. de Marco said. But what seemed to be a political trump card for the PN was the cause of long-term doom for the Labour Party according to former Labour minister Joe Grima, who at the time was a special envoy for Prime Minister Dom Mintoff. With an office at Castille, Mr Grima recalled vividly the black smoke and burning smell when The Times building was gutted. "Without doubt it was an ugly day, but responsibility for those events lies solely with the individuals who perpetrated them," he insisted, describing the thugs as "loose cannons". He condemns the violence but argues Labour was as big a victim of the event as those who got hurt. "Those people went haywire. They are the ones responsible and nobody else. Unfortunately, history only recalls the political spin, which chastised the Labour Party, when nobody in the party ever gave orders for The Times to be burnt down or Dr Fenech Adami's house to be ransacked," he said. Mr Grima's seemingly cold analysis is a reflection of the helplessness felt by party functionaries, like Prof. Fenech. "Back at party headquarters we used to be infuriated by such occurrences," the former general secretary said, insisting that contrary to common assumption, the party had very little control over the organs of state. "Political power was hogged by a handful of ministers, but that is another story. If anyone thinks that Labour, as a party, wanted these things, then they must think it was made up of fools," Prof. Fenech said. It is unlikely the PN leadership believed the Labour Party had fools at its helm but Prof. de Marco does question whether the Labour government had the political will to stop the violence. "If the political will existed it was not manifest," he said. Prof. Fenech said Black Monday must also be seen in the context of what happened throughout the day and the period that preceded it. In the morning an armed man had entered Castille demanding to speak to Mr Mintoff and when he was stopped he fired shots in the ante-room of the Prime Minister's office. Word spread that somebody had tried to assassinate Mr Mintoff, a situation that inflamed the crowd gathered for the mass demonstration held by the Labour Party that afternoon in Valletta. The demonstration was scheduled by the party administration weeks before and it was the culmination of a week of activities celebrating the 30th anniversary of Dom Mintoff's election as party leader. "Whether the people guilty of the attacks were acting out of outrage or opportunity is anyone's guess since we still do not know for sure who they were," Prof. Fenech said, insisting political turbulence was "hardly one-sided". The murder of Karen Grech by a letter bomb two years earlier and the bombs that exploded outside the homes of government officials and businesses were signs that things had been "coming to a head" by the autumn of 1979. "The bombs were liable to interpretation as a strategy of destabilisation after Malta had ceased to be a foreign military base in March 1979," he said, commenting that the PN was no longer the "slumbering" party of George Borg Olivier. According to Prof. Fenech the PN had, under Dr Fenech Adami, undergone a radical re-organisation and mobilisation, determined to win the next election. Dr Fenech Adami had started setting the tone of change for the PN the day he was confirmed party leader by declaring that workers also had a place in the party. Influenced by the Italian Christian democrats he steered the party to the Left, scrapping the Borg Olivier pledge to remove income tax and embarking on a new European direction. In fact, in 1979 the PN executive had approved a historic resolution proposed by Dr Fenech Adami in favour of Malta's membership of the European Community. Black Monday consolidated that work and gave the party a stronger rallying cry in defence of freedom and democracy that intensified after the warped electoral result in 1981. Dr Fenech Adami eventually became prime minister in 1987 and, bar a 22-month interlude between 1996 and 1998, the PN has been in power for 22 years. Today, Black Monday seems to be a distant memory. The wounds should have healed, according to Prof. Fenech, but there are still those who would not let them. He laments some in the PN who still believe they can draw mileage from recalling "selectively" what happened 30 years ago. In the 1970s and 1980s, he said, Labour used to similarly invoke the bitter experiences of Labourites during the 1960s, "maybe as a way of covering up their own contemporary wrongs". "I have more respect for The Times, which suffered the brunt on that eventful day. While I wouldn't say it is perfectly balanced, the paper and the people who make it have moved on," he said. Three days after The Times building was burned down, the newspaper reported that employees had adopted Gloria Gaynor's pop hit I Will Survive as their motto. Not only has the newspaper survived but even the bad memories of that day still live in the minds of those who experienced the events first-hand. But has the country learnt any lessons? With violence no longer part of the political landscape, Prof. de Marco believes the one lesson learnt is that where there is a will there is a way. He adds that people learnt it is possible to do politics without violence. And as he observes the political scene from retirement Dr Fenech Adami is quite sure the country will not go back to those dark times. "Everybody has learnt the lesson," he said.  Parliament resumes sittings after summer recess.  Man brandishing a revolver fires shots at members of Dom Mintoff's secretariat at Castille. Nobody is injured. The gunman, Karmenu Grima, is later seen being taken to hospital bleeding profusely. Hundreds of people gather outside Castille.  Labour supporters later gather in Valletta for a demonstration to mark Dom Mintoff's 30th anniversary as leader.  Supporters hurl fireworks at police guarding PN club in Valletta. Club destroyed. Some shop windows in the area damaged.  Office of Il-Hajja attacked.  The mob attack The Times and set fire to several parts of the building. Staff use ladders to escape. The fire rages all night as equipment and furniture litter St Paul Street. TVM news reports "some incidents and a small fire".  Tourists at neighbouring Castille Hotel ordered to evacuate as a precaution.  PN clubs in Floriana and Birkirkara attacked and torched.  Home of Nationalist Party leader Eddie Fenech Adami in Birkirkara ransacked and looted; his wife Mary is beaten by thugs carrying chains and bars.